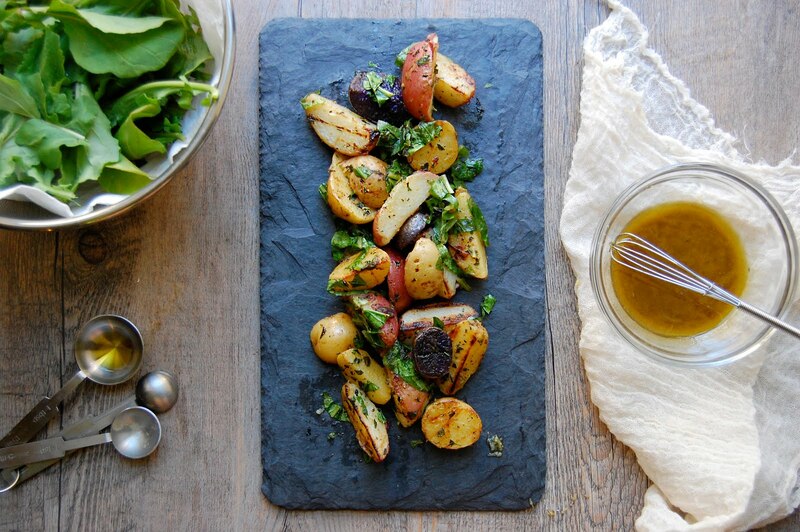 Lemon zest and white pepper bring zing to grilled spuds, with fresh mint adding a cool herbal flavor. A balanced and bright side dish for summer. 1. Wash and scrub 1 3/4 lb mixed baby potatoes. Cover potatoes by 1 inch in water in a medium pot; add salt and bring to a boil over high heat. Cook until potatoes are fork tender -- about 10 to 12 minutes. Drain potatoes and allow to cool slightly. 2. Wash mint and arugula, pat dry between paper towels, then chop. In a small bowl combine 4 tablespoons olive oil, 3 tablespoons fresh lemon juice, 1 teaspoon white pepper and 1 teaspoon lemon zest. Adjust to taste. 4. Heat grill or grill pan over high heat. When potatoes are cool enough to handle, half them (quarter larger spuds), and toss in a medium bowl with olive oil, salt and pepper. Spread onto hot grill in an even layer and cook, turning occasionally, until grill marks appear on all sides. Return potatoes to bowl and drizzle with half of the dressing, 1/4 cup fresh mint and 1 cup roughly chopped arugula. Toss gently to combine and add more dressing as necessary. Garnish with freshly grated fontina and serve warm or at room temperature. Just beautiful - love this flavor combination. Humble food made interesting. A real life win. These sound bright and herbaceous, full of summer.